Michael Faraday, FRS (22 September 1791 – 25 August 1867) was the first person to turn science presentations into an art form. Although Faraday received little formal education, he was an outstanding scientist and a brilliant lecturer. His inventions and discoveries have profoundly influenced the world in which we live. It is his lectures at the Royal Institution that are of interest to the Faraday Club. In 1826, he founded the Royal Institution’s Friday Evening Discourses and the Christmas Lectures for young people. Both these lecture series continue to this day. 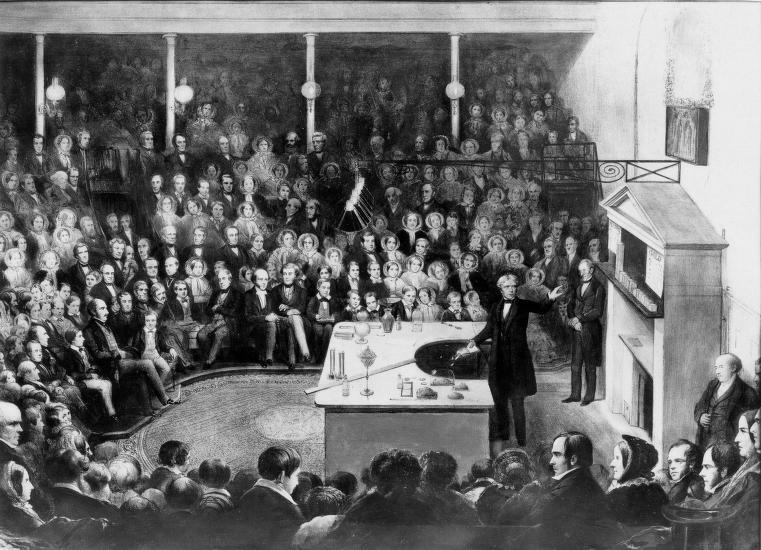 Between 1827 and 1860, Faraday gave the Christmas lectures nineteen times, still a record. He was the outstanding scientific lecturer of his time. “Faraday had much to say about experiments that was very wise. The best experiments are simple and on a large scale, and their workings are obvious to the audience. The worst experiment is one in which something happens inside a box, and the audience is told that if a pointer moves the lecturer has very cleverly produced a marvellous effect. Audiences love simple experiments and, strangely enough, it is often the advanced scientist who is most delighted by them.” (Sir Lawrence Bragg). Quotes from Michael Faraday’s writings recorded in Advice to lecturers. An anthology taken from the writings of Michael Faraday and Lawrence Bragg. London: The Royal Institution of Great Britain, 1974. A flame should be lighted at the commencement and kept alive with unremitting splendour to the end. … the generality of mankind cannot accompany us one short hour unless the path is strewed with flowers. Tis well, too, when the lecturer has the ready wit and presence of mind to turn any casual circumstances to an illustration of his subject. Any particular circumstance that has become tabletalk of the town, any local advantages and disadvantages, any trivial circumstance that may arise in company, give great force to the illustrations drawn from them, and please the audience highly as they conceive they perfectly understand them. Apparatus, therefore, is an essential part of every lecture in which it can be introduced; but to apparatus should be added, at every convenient opportunity, illustrations that may not perhaps deserve the name of apparatus and experiments, and yet may be introduced with considerable force and effect in proper places.